Few things can feel more relaxing than the image of a summer’s afternoon doze in a field of soft fluffy cotton. Soft, breathable and non-allergenic, few fabrics are as well suited to naturally supporting your sleep needs as cotton either. And now, naturally beautiful sleep is yours courtesy of the pure and natural beauty of our Cotton Collection from Millbrook Beds. Our expert craftsmen and craftswomen piece and stitch together the most luxurious in natural fillings such as layers of performance cotton and soft cotton and – together with the enhanced support of individually nested pocket springs – envelope them in a sumptuous hand-tufted Egyptian Cotton cover to create a mattress even more comfortable than your field of dreams. The dream doesn’t end there either. 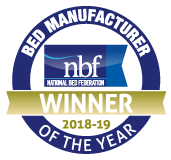 Exacting in our standards, no chemicals are used on our luxurious Egyptian Cotton covers or sumptuous natural fillings and Millbrook Beds are the only UK bed maker to source our cotton from our own shores from English Fine Cottons in the North West of England. When it comes to sleep, the best kind of sleep is the sleep that comes naturally – so choosing a mattress made from naturally comfortable materials makes sense. Our Cotton range features six models ranging from 1000 to 3000 spring count mattresses and is available to buy online or in a quality independent furniture retailer near you.